Gran Turismo 5 is coming to the PlayStation 3 later this year, stuffed with nearly 1,000 cars, over 70 courses, new racing leagues (NASCAR, WRC, Super GT), a track creator and, finally, high-speed kart racing. But wait. There's more. Developer Polyphony Digital is adding a few new tricks and tweaks to what Gran Turismo series creator Kazunori Yamauchi calls a "masterpiece of software." The real driving simulator is adding a new RPG-like management mode—some ten years in the making—along with some new 3D features and a batch of cars that serious car enthusiasts will have a chance to virtually race for the first time. Yamauchi showed off the newest version of Gran Turismo 5 at Gamescom in Germany this week, unveiling a host of previously unannounced features. Let's take a look at what's new. Yamauchi confirmed a batch of new additions to the Gran Turismo 5 stable, including the Subaru Impreza Sedan WRX STI '10, Lexus IS F Racing Concept '08 and Pagani Zonda R '09, the last of which reset the record for commercial cars on the Nürburgring race track. 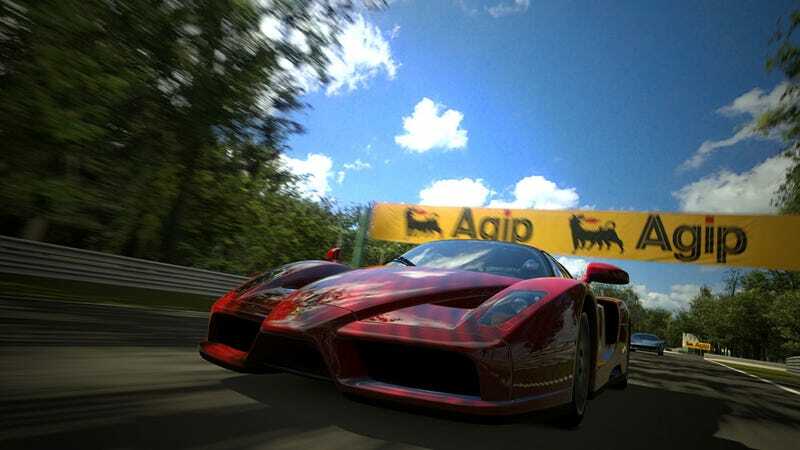 Gran Turismo 5's massive list of playable cars will also include the Ferrari 330 P4 '67, one of Yamauchi's "favorite cars in the world. That Ferrari model won Daytona's 24 hour race in 1967, finishing in first, second and third place, dominating the podium. The Ford Mark IV Racer Car '67, the car that defeated Ferrari's 330 P4 at the 24 hours of Le Mans later that year, is also drivable. The Jaguar XJ13 '67, a car that was "secretly being built by its manufacturer to compete in the Le Mans 67, but canceled before the race" is also included. Yamauchi envisions players holding their own "What if?" races to recreate the 1967 Le Mans competition with those three rival cars to see who comes out on top. Finally, Yamauchi unveiled the Lamborghini Miura P400 Bertone Prototype '67, an extremely rare, "very special" model that the team had an opportunity to go hands-on with and recreate in-game. One new course for GT5 was also previewed, the Autodromo Nazionale di Monza, which Yamauchi described as light on high-speed corners and "highly enjoyable for novices and experts." Yamauchi also attempted to clear up a little confusion about GT5's car collection, which is split into Premium class and Standard class cars. The former is fully and realistically modeled, down to the cockpit, and built from scratch for the PlayStation 3. Standard class cars, however, do not feature cockpit view. Polyphony Digital attempted to add a catch all black frame for Standard class cars to offer a cockpit view, but Yamauchi said two months worth of development on that didn't work out as hoped. Gran Turismo 5 will feature two distinct modes, the A-Spec mode, which fans of the series are familiar with as the "real driving simulator." This is the physics-driven racing simulation portions are played, cars are tuned, and settings are tweaked. A-Spec includes rally racing, Formula One cars, kart racing simulation (great for beginners, Yamauchi claims) and competitions for commercial model production cars. The B-Spec side, the "blue" to the A-Spec side's "red," is the role-playing/management side. Here, players won't drive Gran Turismo's stable of cars themselves. Instead, they'll manage and "nurture" AI-controlled drivers from novice level to professional caliber. These computer controlled drivers will have unique personalities. They can be intimidated to compete in races or hotheaded behind the wheel. You'll need to monitor their physical and mental endurance during races, all from a heads up display while races play out. The B-Spec HUD, dubbed Command Mode, is stuffed with information about the condition of your driver's car, its tires and brakes, details on rival drivers' lap times, placement and more. Of course, you'll have a live feed on display for each race you manage, so you'll see the results of your decisions in real time. The controls appeared relatively straightforward. Yamauchi issued commands to speed up, match pace, overtake other drivers and slow down. Commands given by the player might be ignored by an AI driver that's too "heated" and as the HUD's heat gauge maxed out, the virtual driver started to get a little squirrelly, making mistakes and eventually spinning out. B-Spec mode will let players manage a team of up to six drivers, with four required to compete in a 24 hour race in Gran Turismo 5. We've already talked a bit about Gran Turismo 5's custom course generator, which can spit out racetracks based on a series of parameters and theme-based options. But Yamauchi confirmed that players will be able to do more than just create unique courses and take them for test drives. They can be shared with other Gran Turismo 5 players over the network and can be used in online races. Yamauchi also showed off the game's 3D photo mode, which can generate dramatic stereoscopic 3D images (glasses and 3D TV required, of course). The slideshow we watched looked incredibly sharp and realistic, offering an up close and personal peek at GT5's exotic cars with believable depth. It's the next level of Polyphony Digital's passion for ogling cars. Gran Turismo 5 comes to the PS3 on November 2 in North America, one day later for Japan and Europe.